3D? Terribly lame when it's tossed into devices as a bullet point feature. Making stuff in 3D yourself? Almost always cooler than you think. Trimensional for iPhone takes a picture of your face and maps your mug in a 3D model. You wouldn't think it but it's kinda creepy seeing your face in 3D. Trimensional, $1, iPhone. 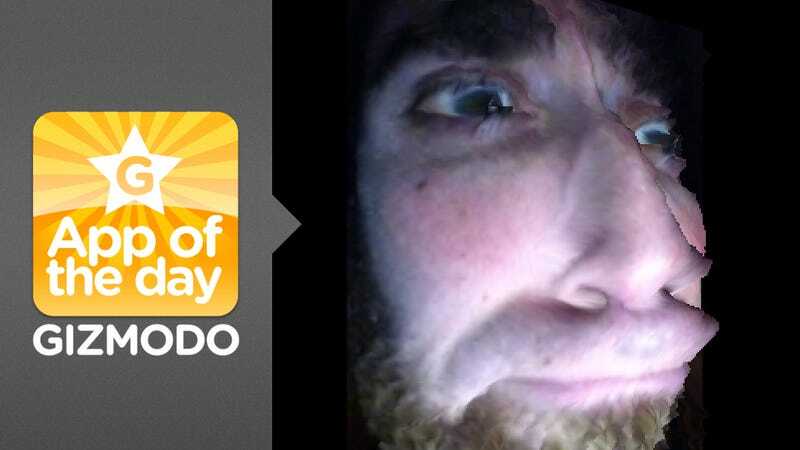 It's a front facing camera app that turns your face into a 3D model. Trimensional is stupid easy to use: go to a dark room, turn your iPhone 4 screen to the highest brightness setting, and snap a close up of your face. The app instantly maps the picture it took it into a 3D model (the speed is really amazing) and you can move the model left and right to see how big your nose is, how far your brow juts out and so on. And of course you want to share your 3D model! You can export and email the 3d picture in either a .mov movie or gif file to show off how silly you look. Also! There are different rendering options on how to see your face too. Textured, meaning like a picture, or gray, like those pre-rendered faceless human bodies you see in video games. Additionally, points, which uses tiny pixels to serve as 3D points, polygons, which connects those dots together and wireframe, which puts the depth of your features on a wire. People who are into 3D. People who think 3D is a gimmick but like gimmicks. People who need a new way to take pictures of themselves. It's way faster and cheaper to buy this app then to outfit yourself with a 3D camera. For advanced users, it also lets you export the 3D model of your face as an OBJ file so you can use in Maya and other 3D software, STL which is great for 3D printing or PLY file which is a "point cloud with position (XYZ) and color (RGB) information per vertex". Well, it's really just a novelty app, you're not going to make anything other than, "hey look at my face in 3D yo!". Also, since it relies on the front facing camera and the brightness of iPhone's screen you're mostly taking pictures of things up-close which limits the fun! I'd love to take 3D models of my room or the Brooklyn Bridge or something (but obviously the iPhone doesn't have the technology for that). I wish you didn't have to go to a dark room to create the model. Easier sharing to Twitter and Facebook (there is none) would help immensely with the fun factor too.